Last week's crash of an unmanned Russian cargo spacecraft underscores the importance of getting private American vehicles up and flying soon, experts say. Russia's Progress 44 supply ship went down over Siberia on Aug. 24, done in by a problem with its Soyuz rocket. 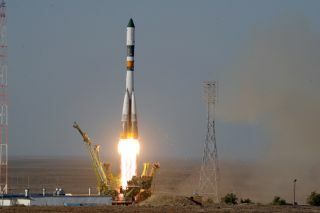 That rocket is similar to the one Russia uses to launch astronauts to the International Space Station, so crewed flights from the country are off the table until the issue is fixed. "It dramatizes the situation we're in," said space policy expert John Logsdon, professor emeritus at George Washington University. "Depending on a single form of access is an invitation to this kind of problem." Engineers investigating the Progress 44 accident have now traced the source of the failure to a malfunction in the gas generator in the Soyuz’s third-stage engine, Russian officials announced earlier this week. When NASA retired its space shuttle fleet in July, the United States became completely dependent on Russia to ferry American astronauts to and from the space station. This reliance, however, was always envisioned as a temporary state of affairs. NASA wants private American companies to take over the Soyuz' orbital taxi role, and soon. To that end, the agency has given money to a handful of aerospace firms — including SpaceX, Boeing, Sierra Nevada and Blue Origin — in two separate rounds of funding under its Commercial Crew Development program. "The commercial crew program was planned from the beginning to result in multiple systems to carry crew to the International Space Station," said John Gedmark, executive director of the Commercial Spaceflight Federation. Having several different firms vying for NASA contracts should drive costs down, improve service quality and protect against "outages" like the one perhaps looming after the Progress crash, Gedmark said. "That's the goal — to have an iPhone, a Blackberry and an Android phone all competing in the marketplace, so you're not just relying on one system," Gedmark told SPACE.com. Others in the industry voiced similar sentiments. "Soyuz is the only way we can get astronauts to the station," Kirstin Brost Grantham, communications direction for SpaceX, told SPACE.com. "The United States needs to have alternatives, and we need to have those alternatives as soon as possible." Ready in four years — or less? Several private spaceflight firms have said they hope to start operational, crew-carrying flights to the orbiting lab by 2015. Some politicians, however, are uncomfortable with being dependent on the Russians for four more years. "The most responsible course of action for the United States is to dramatically accelerate the commercial crew systems already under development," Rep. Dana Rohrabacher (R-Calif.), a senior member of the House Committee on Science, Space and Technology, said in an Aug. 24 statement after the Progress 44 went down. A big cash infusion might indeed speed up the firms' timeline, according to Gedmark. "There's no question that the more funding they receive, the faster they can get up and flying," he said. Russia doesn't have a monopoly on unmanned cargo missions to the space station; the European Space Agency and Japan both launch robotic resupply vessels of their own. But NASA wants American companies to get into this game, too. The space agency has signed deals with SpaceX and the Virginia-based Orbital Sciences Corp. to make supply runs to the orbiting lab. SpaceX has already flown one orbital demonstration mission with its Dragon capsule and Falcon 9 rocket, and the company is getting set to launch its second and final test flight in late November. On that upcoming mission, Dragon will dock with the station and perhaps even offload some supplies. If all goes according to plan, it would be a big moment for private spaceflight, experts say. "If that goes even moderately well, I think it's going to put a significant number of fears to rest on the U.S. side, and among U.S. space station partners," Brian Weeden, a technical adviser for the Secure World Foundation, told SPACE.com. "I think that would be a huge step forward." SpaceX has said it could likely start making cargo runs to the station three to four months after Dragon's second demo mission. For its part, Orbital Sciences plans to launch the first test flight of its Cygnus spacecraft and Taurus 2 rocket in February. That mission would also dock with the orbiting lab. The Progress 44 crash was the latest in a string of Russian rocket failures over the past 10 months. However, it was the first serious issue with a Progress flight after 43 straight successful missions. And Soyuz rockets have performed quite well over the years. That impressive track record is worth remembering. Russia, after all, is a key spaceflight partner of the United States — and will be for some time to come. "One hopes this was a random failure, not something systematic, and that Soyuz can be flying again soon," Logsdon told SPACE.com. "That's the best possible outcome — get back to flying Soyuz quickly, while we develop U.S. alternatives."